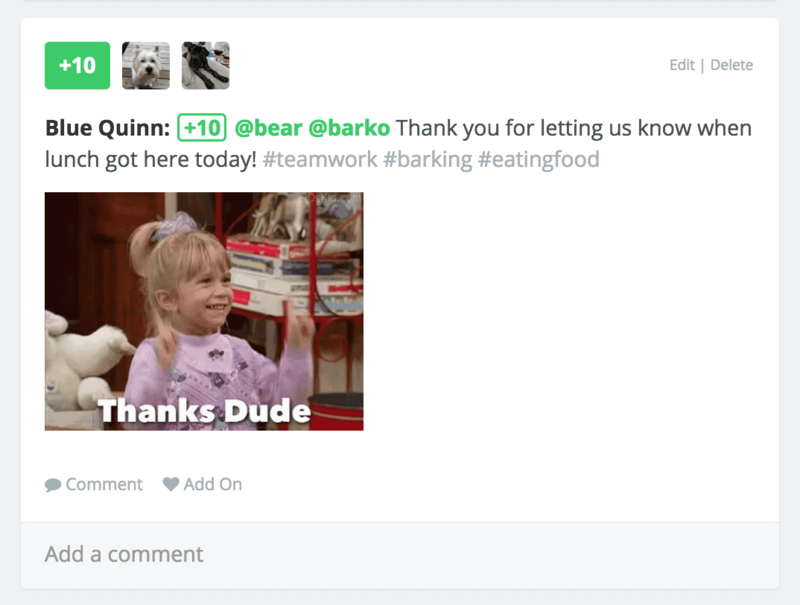 Learn how to give a bonus to groups, add emojis or GIFs, or use formatting options like links and images. Your team really rocked a presentation and you want to recognize everyone on the team. Giving a bonus to a specific group, department, or location is super easy! *If you don't see the group you'd like to give to, start typing the group's name and it will appear. Your teammate did something awesome and you want to make sure their boss sees the recognition you send. You can tag your teammate's boss to send them a notification of the bonus. When you tag a person, it does not give that person points. *The '&' symbol means a user is tagged and will not be bonused. You can type “&” in the bonus field as a shortcut to start a tag. Who doesn't love a fun emoji? 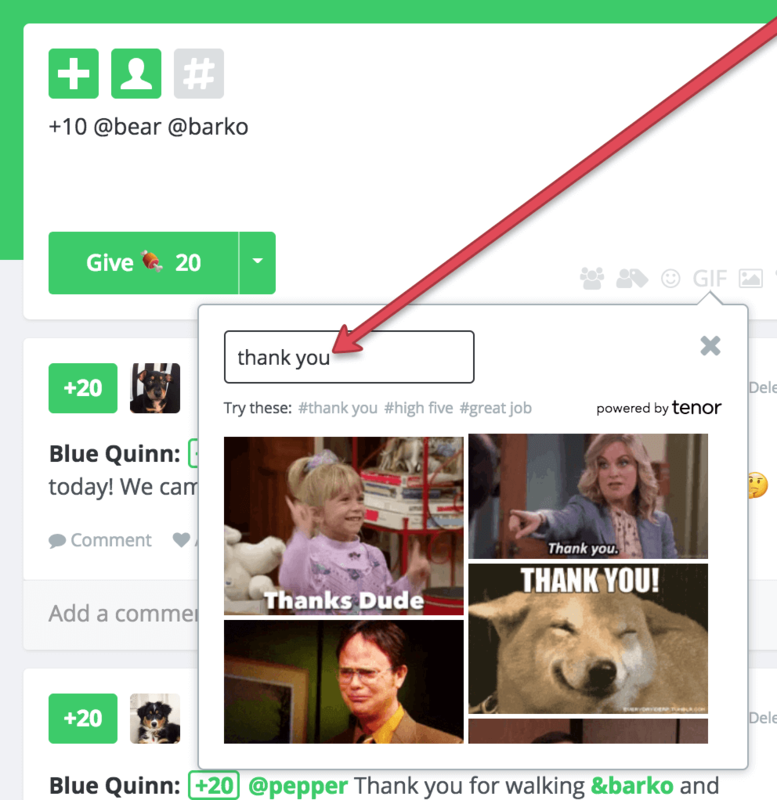 😁 🎉 To add an emoji to your bonus, click the "smile" icon. The emoji picture will be written out in letters. Don't worry, when you post a bonus, it will show the picture! The GIF will now appear in the bonus box in parenthesis. Want to add a picture to enhance your bonus? Images can be great to show off the hard work your colleagues are doing to the entire team. Drag and drop the image into the bonus field. Copy and paste the image into the bonus field. Adding a hyperlink to your bonus is an easy way to refer back to the reason of why you are giving a bonus, so the rest of the team can see the excellent work that inspired the bonus. First you will want to highlight the words you would like to add the hyperlink to. Next select the hyperlink icon. This puts the word(s) you want to hyperlinked into [brackets], and generates a field that looks like this: (url)! Paste the link inside of the (parenthesis). Now you can go beyond just words and have fun with your bonuses! 🎉 If you want to learn more about how to write an inspiring bonus, take a look at our article about how to give a great bonus. Having trouble adding an image? A link? Anything else? Send us an email at support@bonus.ly and we'll be glad to help you out!